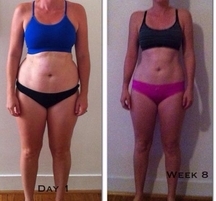 I am so glad I decided to invest in myself and join the Busy Mum Fitness 8 week programme. It has changed my life! Before I so was unhappy with my weight/myself, feeling uncomfortable in my own body, bloated with no energy, headaches. I was determined to commit to it 100% which I did and the benefits are amazing. No longer am I feeling tired, my skin is glowing, headaches are gone, my body is toned, I am fitting back into clothes and I feel GREAT! All it takes is for you to believe in yourself, it’s a journey that you won’t regret. Just remember you are totally worth it! I have loved this journey, the menu with the huge variety of yummy recipes which all my family eat, enjoyable exercise that doesn’t feel like a burden! The mindset, motivation, support from your amazing trainer and from the other mums in your group, how it fits into my life so perfectly.